OECD agrees to end export credits for coal. Professor Roger Martin has a new piece out in the Harvard Business Review discussing the problem of equity valuation in the oil & gas industry. He argues that oil majors have fallen into a toxic cycle of overinvesting aggressively in finding more reserves despite growing signals that many of these reserves will not be burned. This is done because any deviation from that would signal to investors that even their current reserves are overvalued. One possible way out of this trap? Looking to the path pursued by Valeant Pharmaceuticals over the past decade. Members of the Organization for Economic Cooperation and Development struck an historic agreement Tuesday to scale back public financing for coal-fired power plants, dealing another blow to the industry ahead of a global summit on climate change in Paris. Under the agreement, the world’s richest economies will restrict subsidies that helped companies export technology to build coal-fired power plants. Saskatchewan Premier Brad Wall says 50 per cent of the province’s power will come from renewable sources by 2030. With only three per cent of Canada’s population, Saskatchewan accounts for 10 per cent of national greenhouse gas emissions. Most come from the oil and gas sector and electricity generation. Just three per cent of Saskatchewan’s power came from wind last year, according to SaskPower, while 44 per cent came from coal. 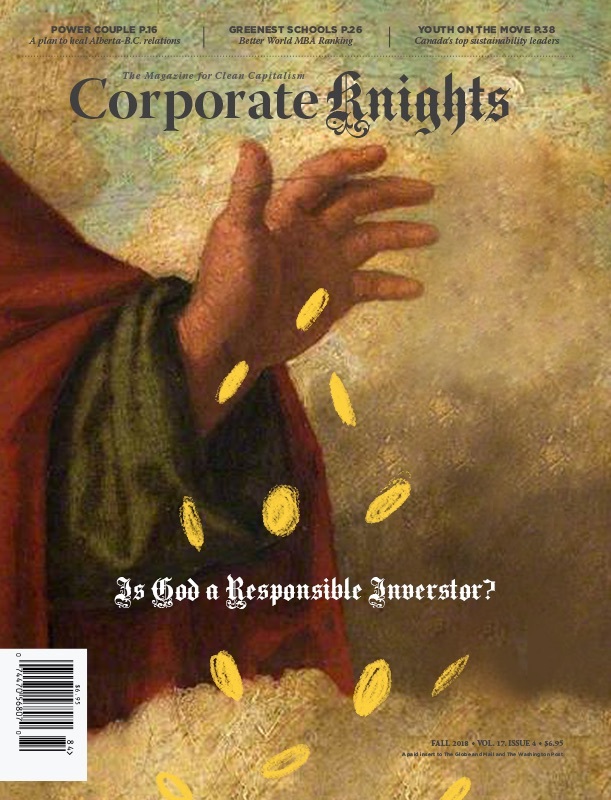 Corporate Knights, together with 350. org and South Pole Group, launched the Clean Capitalist Decarbonizer on Monday, an interactive tool that allows users to determine the financial impact of divesting from carbon heavy companies. Using this first-of-its kind tool, Corporate Knightsanalysed the investments of 14 funds totaling $1 trillion in assets, including the Gates Foundation and ABP, and determined that the scale of losses over the past three years exceeded US$22 billion. CBC, The Guardian, The Star and numerous other publications reported on the Decarbonizer this week, while Corporate Knights CEO Toby Heaps explained to The Exchange’s Dianne Buckner why this demonstrates that the global economic shift away from declining fossil fuel industries toward the rising clean energy economy is already under way. What can you do to get involved? Find the portfolio of your college, institution or pension (clickhere to see how to do this), and run them through the Decarbonizer. Then share the results with us using the hashtag #decarbonizer so we can share them with all of you and send a clear message about what kind of world we want to invest in. The evidence is clear: Women at the top bring environmental, social and governance responsibility to the fore. As more women become embedded in high-level investment, executive positions and boardroom decision-making, the conversation is shifting toward one that incorporates sustainability as the new norm. Therefore, it’s critical that those with the ability to promote gender diversity in companies continue to do so. The Nepalese parliament has elected women’s rights crusader Bidhya Devi Bhandari as its first female president, an important symbolic move for a country beginning to shift away from a traditional male-dominated hierarchy in favour of greater gender equality. Bhandari has also made a name for herself by successfully campaigning for the addition of gender equality as a fundamental right into Nepal’s new constitution.